Liczba stron: 59 Jest to ujednolicona liczba stron, która ułatwi Ci porównanie długości książek. Każda strona Legimi to 200 słów. 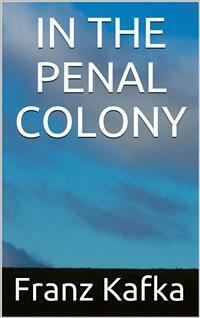 "In the penal colony" is a short story by Franz Kafka.The story is set in an unnamed penal colony. As in some of Kafka's other writings, the narrator in this story seems detached from, or perhaps numbed by, events that one would normally expect to be registered with horror. "In the penal colony" describes the last use of an elaborate torture and execution device that carves the sentence of the condemned prisoner on his skin before letting him die, all in the course of twelve hours. As the plot unfolds, the reader learns more and more about the machine, including its origin and original justification. “It’s a peculiar apparatus,” said the Officer to the Traveler, gazing with a certain admiration at the device, with which he was, of course, thoroughly familiar. It appeared that the Traveler had responded to the invitation of the Commandant only out of politeness, when he had been invited to attend the execution of a soldier condemned for disobeying and insulting his superior. Of course, interest in the execution was not very high, not even in the penal colony itself. At least, here in the small, deep, sandy valley, closed in on all sides by barren slopes, apart from the Officer and the Traveler there were present only the Condemned, a vacant-looking man with a broad mouth and dilapidated hair and face, and the Soldier, who held the heavy chain to which were connected the small chains which bound the Condemned Man by his feet and wrist bones, as well as by his neck, and which were also linked to each other by connecting chains. The Condemned Man had an expression of such dog-like resignation that it looked as if one could set him free to roam around the slopes and would only have to whistle at the start of the execution for him to return. The Traveler had little interest in the apparatus and walked back and forth behind the Condemned Man, almost visibly indifferent, while the Officer took care of the final preparations. Sometimes he crawled under the apparatus, which was built deep into the earth, and sometimes he climbed up a ladder to inspect the upper parts. These were really jobs which could have been left to a mechanic, but the Officer carried them out with great enthusiasm, maybe because he was particularly fond of this apparatus or maybe because there was some other reason why one could not trust the work to anyone else. “It’s all ready now!” he finally cried and climbed back down the ladder. He was unusually tired, breathing with his mouth wide open, and he had pushed two fine lady’s handkerchiefs under the collar of his uniform. “Don’t you want to sit down?” he asked finally, as he pulled out a chair from a pile of cane chairs and offered it to the Traveler. The latter could not refuse. He sat on the edge of the pit, into which he cast a fleeting glance. It was not very deep. On one side of the hole the piled earth was heaped up into a wall; on the other side stood the apparatus. “I don’t know,” the officer said, “whether the Commandant has already explained the apparatus to you.” The Traveler made a vague gesture with his hand. That was good enough for the Officer, for now he could explain the apparatus himself. “However,” the Officer said, interrupting himself, “I’m chattering, and his apparatus stands here in front of us. As you see, it consists of three parts. With the passage of time certain popular names have been developed for each of these parts. The one underneath is called the bed, the upper one is called the inscriber, and here in the middle, this moving part is called the harrow.” “The harrow?” the Traveler asked. He had not been listening with full attention. The sun was excessively strong, trapped in the shadowless valley, and one could hardly collect one’s thoughts. So, the Officer appeared to him all the more admirable in his tight tunic weighed down with epaulettes and festooned with braid, ready to go on parade, as he explained the matter so eagerly and, while he was talking, adjusted screws here and there with a screwdriver. The Soldier appeared to be in a state similar to the Traveler. He had wound the Condemned Man’s chain around both his wrists and was supporting himself with his hand on his weapon, letting his head hang backward, not bothering about anything. The Traveler was not surprised at that, for the Officer spoke French, and clearly neither the Soldier nor the Condemned Man understood the language. So it was all the more striking that the Condemned Man, in spite of that, did what he could to follow the Officer’s explanation. With a sort of sleepy persistence, he kept directing his gaze to the place where the Officer had just pointed, and when the question from the Traveler interrupted the Officer, the Condemned Man looked at the Traveler, too, just as the Officer was doing.